The Crescent’s Ron Barber Studio is home again to yet another outstanding production. Director Stewart Snape’s take on the Peter Shaffer classic is instantly engaging, thoroughly engrossing and blisteringly devastating. The mighty Colin Simmonds completely inhabits the role of disillusioned psychiatrist, Martin Dysart, charged with his most disturbing case ever: the case of an (un)stable boy who, for some reason or other, took it upon himself to blind six horses in one night. Simmonds’s Dysart feels as well-worn as his jacket, jaded in his erudition, and also very funny. Shaffer’s play has a rich seam of humour running through the soul-searching and philosophising and Snape gets the tone spot on. Dysart’s professional relationship with kindly magistrate Hesther comes across, thanks to the chemistry between Simmonds and Jo Hill, but of course, it is the scenes between Dysart and his patient that grip and thrill the most. Sturdy support comes from Andrew Lowrie as Alan’s repressive father – nowadays we might call him ‘gammon’ – and Zena Forrest as Alan’s mother, credibly desperate (beneath a somewhat ill-advised wig!) as she seeks to understand but mainly exonerate herself from the shocking act of violence perpetrated by her child. Jess Shannon is matter-of-fact as Alan’s attempted love interest, Jill – a pleasing contrast to all the wordy soul-searching of the others; Angela Daniels makes a formidably efficient Nurse; while Josh Scott has his moment as the bewildered stable owner. Phil Leonard makes a strong impression as the Young Horseman, and also as Nugget, one of the ill-fated horses. As is customary in this show, the horses are represented by actors in stylised masks, using movement (head tossing, foot stamping) to evoke horsiness. John Bailey’s creations for this production are elegant constructions of wire that the actors don like ritualistic masks. The tramping of their hooves, and assorted other noises, add to the tension. The story is played out on a set of wooden floorboards and railings, suggestive of the stable, and also of a performance space: it is where Alan’s memories are staged, and also his place of worship. The face of a horse is stained into the wood, reaching up the back wall and along the floor, almost like a presence itself. Colin Judges’s design is beautifully efficient, superbly suited to Shaffer’s theatrically sophisticated script, where narration and reconstruction are entwined with more naturalistic scenes. John Gray’s splendid lighting, warm straw and cold blue, adds to the atmosphere. This play about passion builds to a searing climax: the stylised re-enactment of the crime itself, a Bacchic moment, horrific in a symbolic way, leading Dysart to understanding at last, and brings to a close another superlative offering from the Crescent. 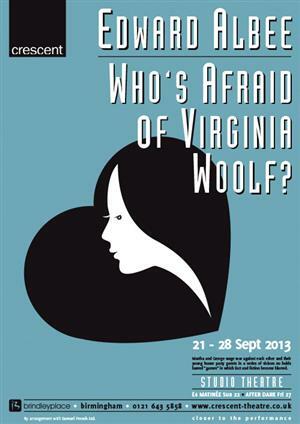 The Crescent’s new season gets off to a fine start with this adaptation of F Scott Fitzgerald’s most famous novel. Stephen Sharkey’s script retains the timbre of Fitzgerald’s prose, mainly in the mouth of our narrator Nick Carraway (John O’Neill). Through Nick’s eyes we visit the partygoing rich of the Twenties, a carefree elite who drink and dance every night away. By sheer coincidence, Nick happens to be renting a property next to the massive mansion of the titular Gatsby, who happens to be an old flame of Nick’s cousin, Daisy, who has since married Tom Buchanan… Gatsby urges Nick to organise a reunion, an event from which tragedy springs. John O’Neill is a serviceable narrator, handling Fitzgerald’s heady words in a matter-of-fact way. As Gatsby, Guy Houston exudes a suave and easy charm; along with Nick we come to understand the man and his motivations. Colette Nooney’s Daisy is coolly laconic while Laura Poyner’s fiery Myrtle injects passion into the piece. Mark Fletcher’s Tom Buchanan has an air of Clark Gable to him. Kimberley Bradshaw seems perfectly at home in the era as famous golfer, Jordan Baker. All the main players are in fine form, in fact, with strong support from character parts: Jason Timmington’s Treves, for example, and Simon King’s Wolfsheim, who brings a flavour New York into this rarefied atmosphere. James Browning’s George Wilson is a fine characterisation but he needs to lift his head more so we see more than the top of his flat cap. The play saves all its action until the end as the consequences of the characters’ behaviour burst to the fore. We are amused by these people but kept at a distance from them – in the end, we have only warmed to Nick and Gatsby – and so Fitzgerald’s critique of the in-crowd sinks in its teeth. This is the empty hedonism of Made In Chelsea with dramatic bite. As ever, production values at the Crescent are strong. The art deco arches that represent Gatsby’s gaff, with their artificially organic elegance, evoke the period as soon as we see them. Keith Harris’s set flows swiftly from each location to the next – there are a lot of scenes and changes are enhanced by Jake Hotchin and Tom Buckby’s lighting design, especially the beautiful work on the cyclorama. Stewart Snape’s costumes fulfil our expectations of the era – Gatsby’s outfits are particularly snazzy – and Jo Thackwray’s choreography gives us all the Charleston moves and black bottoms we could wish for. If I had to nit-pick, I would say at times the music playback needs to be a touch louder, and a crucial sound effect – a car crash – needs to have more impact. It is the turning point of the story, after all. Director Colin Judges keeps a steady pace, allowing moments of humour to surface like bubbles in champagne. Stylish and elegant, this is a great Gatsby. Agatha Christie’s courtroom drama is a far cry from the typical, almost cosy murder mystery affair to which she is inextricably linked. The play uses the trappings of civilised society, i.e. a court of law, to expose the seedy underbelly of human nature. In the safe haven of our seats in the auditorium, we enjoy the unfolding details – a violent murder, acts of betrayal – but there is a bitter aftertaste to this entertainment that reminds us our fascination with crime as drama is, at best, a guilty pleasure. This production exudes excellence at every turn. A top-notch cast populates the story with credible characterisations, breathing life into Christie’s wry observations and the more verbose legalese of the professional lawmen. Geoff Poole and Katie Merriman get things off to a promising start with some amusing character work as employees of Sir Wilfred, the barrister defending the case. Their accents give us both place and period. We’re in London in the 1950s. Bill Barry is excellent as Sir Wilfred. He and Brian Wilson, as lawyer Mayhew, give off an air of focussed professionalism, inspiring confidence in the system at work. Equally strong is the barrister for the prosecution, Myers (John O’Neill), grandstanding in the courtroom under the quiet authority of Mr Justice Wainwright (Geoff Poole again, in complete contrast to his earlier role). When Zena Forrest enters, as German ex-pat Romaine Heilger, she makes a striking impression, not just because of her Teutonic froideur. Angela Daniels’s costume work cuts a dash – especially with the female characters. After all, men’s suits and the accoutrements of the court have barely changed for decades! Forrest is superb as the haughty femme fatale, provoked on the witness stand to losing her composure and saying too much… Alex Whiteley makes a good fist of Scottish busybody, Janet McKenzie, bringing humour to proceedings with a pleasing appearance in the box. Director Les Stringer keeps us hooked throughout. It’s a lengthy sit (three hours, including two intervals) but Stringer manages to avoid any sense of the staid and the static in scenes that involve a lot of talk and a lot of sitting around. He contrives a crescendo at the end of the second act between prosecutor and prisoner, that is absolutely electrifying. The set by Colin Judges (his real name) is stunning for the courtroom scenes, displaying craftsmanship to be sure, but it also says something. The court speaks of power and permanence, and the establishment at work. The set adds to the authenticity of the piece as much as the language and ritualised conduct of the court. But even the establishment can get it wrong sometimes, Christie reminds us. Christie provides more twists than Chubby Checker for a thrilling denouement. The tables aren’t just turned, they spin! Mark Payne dazzles, if that’s the right word, as nervy defendant Leonard Vole, as twitchy as his rodent namesake. Personable and decent, he elicits our sympathy from the start, in what develops into a towering and emotional performance with real star quality. A thoroughly enjoyable, old-school visit to the theatre, but old-fashioned does not mean lacking in power to entertain. On the contrary, when it is played and presented this well, you know you’re in safe hands for a good night out. Edward Albee’s masterpiece from 1962 has lost none of its bite and this studio production directed by Colin Judges packs quite a punch. George and Martha (I keep wanting to call her Mildred) are a couple who tear strips off each other in their verbal sparring. It is the way they operate, through vicious snarking and sniping. They are joined for some very late night drinks by a young couple they met at a faculty party hosted by Martha’s father, who runs the university at which George and the younger man, Nick, teach. There are few things more embarrassing than being witness to a marital spat but George and Martha go further than that. So hurtful and hateful is the sparring between them, the couple find themselves not only spectators to a bout of hostilities but also embroiled and implicated in them. As Martha, Tanya Coleman is loud and brash, with Bette Davis vowels and intonation. She is excellent with her sarcastic commentary on her husband’s shortcomings, often bursting out into loud and violent invective. By contrast, George is quieter and more controlled; Andy Butterworth is perhaps a little too quiet at times, and some of his lines get lost. George needs a little bit more oomph if we are to understand why Martha hasn’t made mincemeat of him long ago. Jason Rivers’s Nick is a little too distant. I would like to see more discomfort and embarrassment before the drink takes him over. As Nick’s wife Honey, Laura Poyner gives the best performance of the piece, finely detailed and well-observed; she is utterly credible as a young woman quietly becoming inebriated on brandy among the maelstrom of marital strife. The direction handles the escalation of the many rows very well but there are some losses of momentum, particularly in the scenes between the two men – a pity when other moments are electrifying. George and Martha’s tragedy is eventually revealed at the play’s climax and is very well handled here. With a little tightening and a little more truth, this could be a blistering piece of theatre. The Ron Barber Studio at Birmingham’s Crescent Theatre is an excellent, little – sorry, intimate space with an interesting and varied programme of shows. This production of David Mamet’s 1975 three-hander maintains the high standard. It is an absorbing and powerful evening in the company of a trio of low-life petty criminals as they plan a burglary in the back room of a cluttered and dismal junk shop. The shop is run by Donny (Gerry Lucas), who bankrolls and ‘masterminds’ the job – in as far as his limited abilities allow. He is a bit of a soft touch, especially when it comes to the younger of his acquaintances, Bobby (Michael Radford) and tends to lose patience with the more neurotic Teach (Colin Simmonds). Mamet’s language is earthy and deceptively naturalistic. Add to that, the humour, the underlying sense of menace and the low-level crime, and you have something akin to an American Pinter – this has been noted by others before me. I rather think Mamet is the link between Pinter and Tarantino. Without Mamet, Reservoir Dogs, for example, would be a very different film. The cast is impeccable. Sleazeball Teach is very funny and yet repugnant and unsettling. Colin Simmonds is note perfect – when Teach finally blows his top and trashes the shop, it is an exhilarating release of the tension that has built up throughout the evening. And what a set it is! Cluttered with details, messy and lived in – this is a credible and workable environment. Colin Judges and his construction team have recreated a corner of 1975. In that studio space, the audience is almost sitting around the card table with the characters. When Teach pushes the shelves over and sends crockery flying, you feel like you will get clobbered. Mark Thompson’s direction keeps the pace up – the set may be cluttered but the action has room to grow, the characters have space to reveal themselves. Michael Radford’s Bobby is sensitive, barely able to articulate his thoughts. You wonder what would become of him with a different pair of role models. Donny is the indulgent father figure, peeling off banknotes and offering dietary advice. Here I must make special mention of the Chicagoan accents. Vocal coach Jaz Davison has equipped the cast with authentic intonations. I couldn’t fault them. Gerry Lucas’s performance is the lynch pin of the production and the key to understanding the play. Crime and business are held up as two sides of the same coin – not the rare coin that gives the play its title and the plot its impetus, but a bent, two-headed one. The men approach the burglary as a business venture. At best, they are amoral. This is their version of the American Dream – the right of every man to turn a profit. They are self-serving capitalists and, the play shows us, that road leads to ruin. Donny’s ill-advised loans to Bobby, the inability to handle setbacks (a fourth, unseen accomplice is hospitalised), the use of force and the destruction of the shop (marketplace) all point towards disaster. Suddenly, Mamet’s thirty-odd year old play is bang up-to-date and relevant to fiscal policy and the current financial crisis.